죄송합니다. 다음과 같은 이유로 인해 귀하의 요청을 처리할 수 없습니다. Please note prices may vary if more than one card is being sent in the same package to the same address. Please select the Village you wish to buy a Gift Card for. 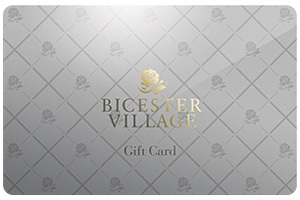 Bicester Village의 새로운 Gift Card를 소중한 가족과 친구들에게 선물하면 권장소매가 대비 최대 60%까지 할인된 가격으로 주요 명품 브랜드를 구매할 수 있습니다. Looking to buy more than one Card? Please 여기를 클릭. Please select a Card value between £5 및 £300 의 최대 주문 값 주목£300 . Please enter the name of the Gift Card recipient and your preferred delivery method. [**item**] 선택 ÎÇ®ÏÑ±. Í∏∞Ìòº Ïó¨ÏÑ±. ÎØ∏Ìòº Ïó¨ÏÑ±. Ïó¨ÏÑ±. 주소 배달에 허용되는 최대 카드 금액 이 £300초과되었습니다. 빌리지에서 수령을 선택하거나 더 낮은 카드 값을 입력하십시오. 아래에 쿠폰 번호를 입력하십시오 . 아래 필수입력란을 작성하시고 다시 시도해 주십시오. Gift Cards expire and cannot be used 12 months after the date of activation. Please note that all Gift Cards are non-refundable. To view full Terms and Conditions 여기를 클릭.